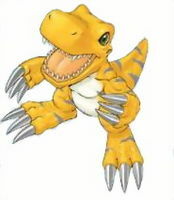 Difference between revisions of "Agumon X-Antibody"
A Reptile Digimon which has grown up and become able to walk on two legs, it has an appearance like a tiny dinosaur. Because it is still on the way to adulthood, its power is low, but as its personality is quite ferocious, it doesn't understand fear. It has grown hard, sharp claws on both its hands and feet, and demonstrates its power in battle. It is also a being that foretells evolution to a great and powerful Digimon. Its Special Move is spitting flame breath from its mouth to attack the opponent (Baby Flame). 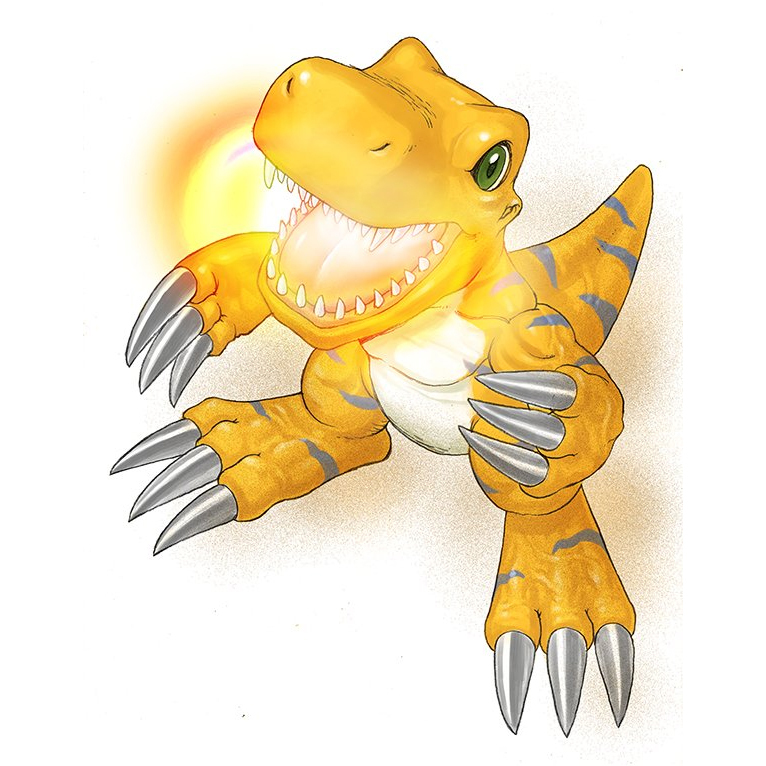 As a Dinosaur-type, its qualities for evolving into an especially outstanding Greymon-species have improved, unique blue lines appear in its body color, and it is not a Reptile-type anymore but is classified as a Dinosaur-type. 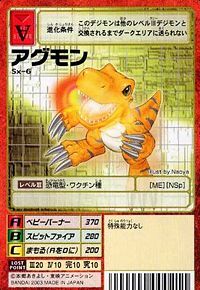 Its claws honed, increasing its lethal potential further, and as a result of its ferocity being drawn out more strongly, it has become possible for it to fire its "Baby Burner", in which it amasses single shots of "Baby Flame" in its mouth and then spews it out all at once. 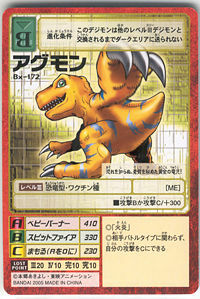 Its qualities for evolving into a Greymon-species have improved, and blue lines appear in its body color. Special Move: Amasses flaming breath and then spews it out all at once (Baby Burner). 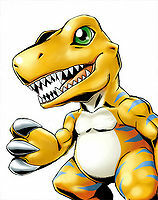 Sorry, but Agumon X-Antibody's profile hasn't been translated yet. May come from aguagu (「アグアグ」) which is the sound of biting. Anime/Manga D-Cyber: "To the Depths of Evil"
Accumulates a Baby Flame's power in its mouth before exhaling. Spits fire from its mouth. 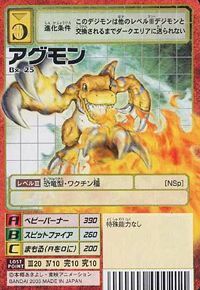 Fires a large fireball from its mouth. Can be obtained it in some events, or buying cash items, like "egg" or "T.F.U". It evolves to Geo Greymon. Evolves from Dorimon if trained 9 times or less. 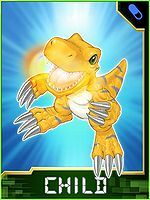 Can evolve to Greymon X-Antibody, Raptordramon (1.0 only), DORUgamon, Death-X-DORUgamon (1.5 only), Seadramon X-Antibody or Kuwagamon X-Antibody. Evolves from Frimon. Can evolve to Blade Kuwagamon, Greymon X-Antibody, Pegasmon, or Revolmon. This golden dragon child knows no fear, hiding its true powers!